Pardon me while I fall over laughing. ow, ow, ow. make it stop hurting! 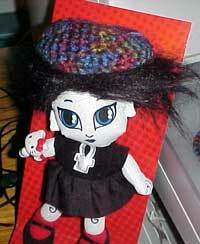 Will you settle for Li'l Death with a hand crocheted hat and a Hello Kitty stamper bracelet? If so, she is here. Oh. my. I can't say anything else. thank you so much for sharing that image!